l a v e n d e r . . . Sow: your lavender seeds under glass, either in the autumn or spring, and cover seeds with a light layer of compost. Seeds can be slow to germinate, so don’t give up too quickly. Plant out seedlings when large enough to handle, adding some grit or sharp sand to the soil around the roots. 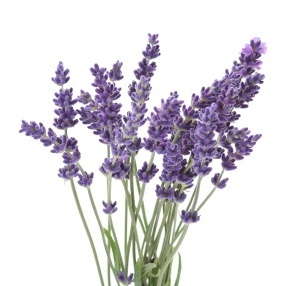 Lavender prefers a sunny, sheltered site with well-drained soil; it can tolerate poor soil and very little watering. It also makes an attractive patio plant. Choose a large, deep pot and, again, add a couple of handfuls of grit or sharp sand to the compost to help with drainage. Aftercare: Little feeding should be necessary and it’s even fairly tolerant of drought, although container grown plants are likely to need watering. After flowering, prune back plants to encourage bushy growth. As well as baking with lavender, try tucking a few springs of dried flowers in your pillowcase for a wonderful, relaxing sleep or place a vase of dried flowers near to an open window to waft their gorgeous scent through your home. Make lavender sugar by snipping a few sprigs of your pretty home grown lavender on a nice dry, sunny day. Add the flowers to a jar of caster sugar then simply leave for a week or two, shaking occasionally. Use complete with flowers or sift prior to use if you prefer. Will keep for around 6 months in a sealed container. Use your subtly flavoured and deliciously scented sugar to make scrumptious cupcakes, buttery shortbread, or simply sprinkle over summer berries.